1. Rinse and drain the strawberries in cold water. 2. Hull and quarter the strawberries and then put them in a food processor . 3. On the cutting board, cut a thin slice on top and bottom of the kiwi. From the top to the bottom , carefully slice the skin of the kiwi off and roughly cut the kiwi. 4. In the food processor , blend the strawberries with 1tbsp of confectioners sugar . 6.Blend the kiwi with 2tbsp of confectioners sugar. 8. Add the first layer(strawberry)into the fruit pop mold and freeze for 1 hour. 9.Add the next layer (kiwi) into the mold and freeze for a hour. Then gently stick the stuck into the first layer. 11. Do not fill the molds all to the top since the mixture will expand a little as it freezes. 12. 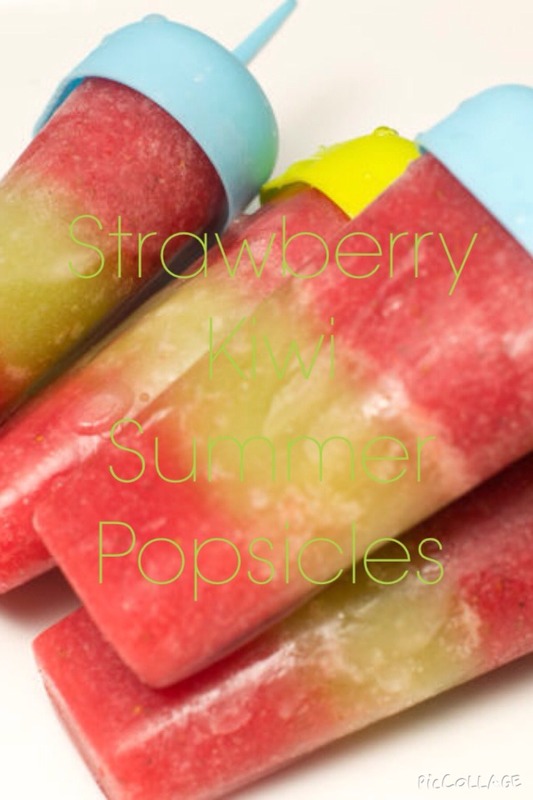 Freeze the pops for a final 1-2 hrs before eating. By WikiHow! Ingredients on last pg.